There are now 4 eggs in the nest box and the parents are actively incubating eggs. It is hard to find a time when there is not a bird in the box on top of the eggs. Rebecca laid eggs about every other day starting on Friday evening, March 27. 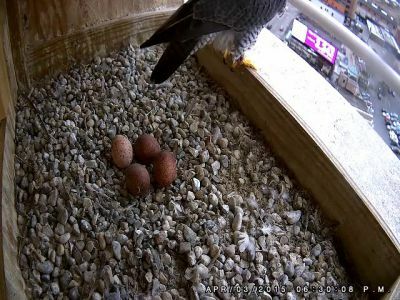 The second egg was laid on Sunday evening March 29, followed by afternoon egg laying on April 1 and April 3. Video clips documenting the 3rd and 4th eggs being laid are available in the video gallery. In addition to laying eggs, there were two witnessed territorial disputes with falcons traveling through the area. The first was on March 26, followed by a dispute on March 29, which was captured in photographs by Dave Chmielewski who just happened to be on the parking deck with his camera. He shared some of his amazing shots with us and you can see them in the photo gallery. Rebecca and Kewpee successfully defended their territory both times and there were no injuries to any of the birds. Both Rebecca and Kewpee are both spending time incubating the eggs. The typical incubation period is 30 days, so we have the first week in May targeted as the time for hatching. Between now and then, it seems like we will be watching the birds being relatively quiet in the nest box.